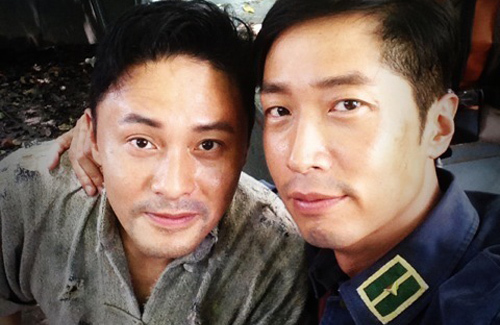 Above: Steven Ma and Raymond Cho on set “Property Protector”. Earlier in June, Steven Ma (馬浚偉) suffered two nose fractures while filming new TVB drama, Property Protector <守業者>. In another mishap, Steven was hospitalized due to his heart condition and over-exertion in the hot weather. After a day of rest, he was back at work. Originally scheduled to attend a TVB conference in Beijing, Steven’s heart condition suddenly took a turn for the worse due to the hectic filming and blazing temperatures in Guangdong’s Yingde and Xijiao cities. He was immediately sent to the hospital where he was administered three packets of saline water. Earlier, Steven revealed that he was suffering from a chronic heart condition where two nerves in his heart behave abnormally when they come into contact, resulting in his heart to beat rapidly, reaching over 170 beats per minute at a time. As a result, he had to take medication regularly. Merely after a day of rest, Steven was back at work after his hospitalization. Understanding that they have to rush the filming, Steven preferred to go back to work to make sure filming is on schedule. I’ve always known Steven Ma to be extremely professional but he seriously has to take better care of himself! As usual the tabloids sensationalized the incident. 2nd – Steven was not hospitalized, he went to the hospital to consult a doctor about his abnormal heart rate. 3rd – The news article omitted to report that the incident happened on 8/21. Steven has long since recovered. Incidentally, Steven going to the hospital over his abnormal heart rate was reported 8/28 on tv. Thanks clamine. Always reliable with Stephen’s news! Thanks for the clarification! Tabloid’s will always add their salt and vinegar into their work..
Wow, sounds like filming this series is especially tough. Raymond and Tavia have both complained on weibo about the long hours. Sadly, the trailer doesn’t make the series look interesting despite all the artists hard work. I can’t believe that a modern series is already so much work. Just imagine if it was a period/ancient drama. I bet it would be even more tough. No wonder Steven wanted to do a modern one instead, but he is still working so hard and enduring so much. I wish TVB would treat their artists and staff better. Actually, PP has excellent reviews from baidu tvb and weibo netizens. I myself thoroughly enjoyed that trailer. i think he is in love with tavia,he especially asked tvb for tavia to be his co-star and behaves very intimate with tavia on the set with her. I would say the same about Tavia behaving intimately with Steven, too. Anyway what I see is 2 old friends being extremely comfortable with each other. I love their synchronized swaying rhythm as one – Tavia leaning against Steven, and Steven resting a lazy arm over Tavia’s shoulder swaying back and forth, back and forth; so comfortable in each other presence. He (Steven) denies the rumor that he had specifically picked Tavia as his partner in his return tvb series. When asked about the said rumor, Steven says if he returns to TVB he certainly will not specify who his female partner should be, just like he never did when he was in TVB. He believes chemistry can be sparked with just any partner. maybe you right,but i think they shouldnt behaves so intimate with each other since she is the girlfriend of him law.but i think tavia and steven ma looks more like an couple and have more chemistry than with him law. him law is too young for her anyway. You honestly do not know what the artists are thinking in their mind. Even if they did have feelings for each other, they would not allow others to know about it, especially if they have a boyfriend/girlfriend already. I think Steven and Tavia are such a great match. Would personally be happy if they got together. However, if they have feelings for each other they would have got together many years ago. So i dont think they are romantically in love. As clamine said, I think they are just old friends that are very comfortable with each other. More than that, with Tavia’s boyish behaviour, I think they are like brothers, heng dai, type relationship. So maybe brotherly love? With so many incidents about his health/injuries, etc., he will dig himself an early grave before getting his long sought after TV King award. Yes, I always wonder why Steven always goes back to TVB…especially after all that talk about leaving. I don’t think he’s doing it for the TV King award. He’s smart enough to know that it won’t fall into his hands. Glad that Steven is okay now. I am excited for Property Protectors mainly because of Steven and Tavia. They better have a happy ending this time! The trailer for Property Protector catches my attention and seeing how intense it is. I’m looking forward to this series and the cast too.